The following series of articles are discussions of current identifications, classification, and treatments of leukemias, myelodysplastic syndromes and myelomas. 6.2.4.1.6 Measurement of granulocyte maturation may improve the early diagnosis of the septic state. 6.2.4.1.7 The automated malnutrition assessment. 6.2.4.2.2 Next-generation sequencing in hematologic malignancies: what will be the dividends? 6.2.4.2.3 Leveraging cancer genome information in hematologic malignancies. 6.2.5.2.2 Novel approaches to the treatment of acute myeloid leukemia. 6.2.5.3.2 What`s new in chronic myeloid leukemia research and treatment? Blood cells are divided into three groups: the red blood cells (erythrocytes), the white blood cells (leukocytes), and the blood platelets (thrombocytes). 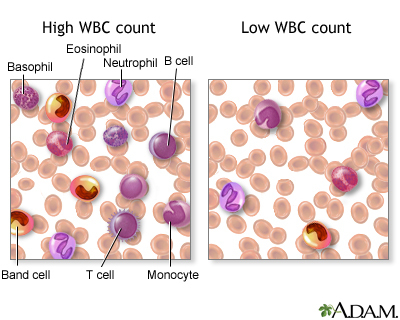 The white blood cells are subdivided into three broad groups: granulocytes, lymphocytes, and monocytes. Blood cells do not originate in the bloodstream itself but in specific blood-forming organs, notably the marrow of certain bones. In the human adult, the bone marrow produces all of the red blood cells, 60–70 percent of the white cells (i.e., the granulocytes), and all of the platelets. The lymphatic tissues, particularly the thymus, the spleen, and the lymph nodes, produce the lymphocytes (comprising 20–30 percent of the white cells). The reticuloendothelial tissues of the spleen, liver, lymph nodes, and other organs produce the monocytes (4–8 percent of the white cells). The platelets, which are small cellular fragments rather than complete cells, are formed from bits of the cytoplasm of the giant cells (megakaryocytes) of the bone marrow. In the human embryo, the first site of blood formation is the yolk sac. Later in embryonic life, the liver becomes the most important red blood cell-forming organ, but it is soon succeeded by the bone marrow, which in adult life is the only source of both red blood cells and the granulocytes. Both the red and white blood cells arise through a series of complex, gradual, and successive transformations from primitive stem cells, which have the ability to form any of the precursors of a blood cell. Precursor cells are stem cells that have developed to the stage where they are committed to forming a particular kind of new blood cell. In a normal adult the red cells of about half a liter (almost one pint) of blood are produced by the bone marrow every week. Almost 1 percent of the body’s red cells are generated each day, and the balance between red cell production and the removal of aging red cells from the circulation is precisely maintained. Because of the inability of erythrocytes (red blood cells) to divide to replenish their own numbers, the old ruptured cells must be replaced by totally new cells. They meet their demise because they don’t have the usual specialized intracellular machinery, which controls cell growth and repair, leading to a short life span of 120 days. This short life span necessitates the process erythropoiesis, which is the formation of red blood cells. All blood cells are formed in the bone marrow. This is the erythrocyte factory, which is soft, highly cellar tissue that fills the internal cavities of bones. Basophilic normoblast also called an erythroblast. Initially there is a nucleus and as the cell matures the size of the nucleus decreases until it vanishes with the condensation of the chromatin material. Low oxygen tension stimulates the kidneys to secrete the hormone erythropoietin into the blood, and this hormone stimulates the bone marrow to produce erythrocytes. Rarely, a malignancy or cancer of erythropoiesis occurs. It is referred to as erythroleukemia. This most likely arises from a common myeloid precursor, and it may occur associated with a myelodysplastic syndrome. Note that the mature forms of the myeloid series (neutrophils, eosinophils, basophils), all have lobed (segmented) nuclei. The degree of lobation increases as the cells mature. 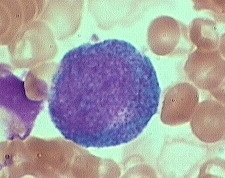 The earliest recognizable myeloid cell is the myeloblast (10-20m dia) with a large round to oval nucleus. There is fine diffuse immature chromatin (without clumping) and a prominant nucleolus. The cytoplasm is basophilic without granules. Although one may see a small golgi area adjacent to the nucleus, granules are not usually visible by light microscopy. One should not see blast cells in the peripheral blood. The promyelocyte (10-20m) is slightly larger than a blast. 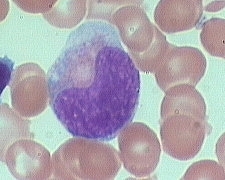 Its nucleus, although similar to a myeloblast shows slight chromatin condensation and less prominent nucleoli. The cytoplasm contains striking azurophilic granules or primary granules. These granules contain myeloperoxidase, acid phosphatase, and esterase enzymes. 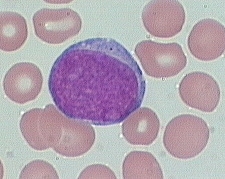 Normally no promyelocytes are seen in the peripheral blood. 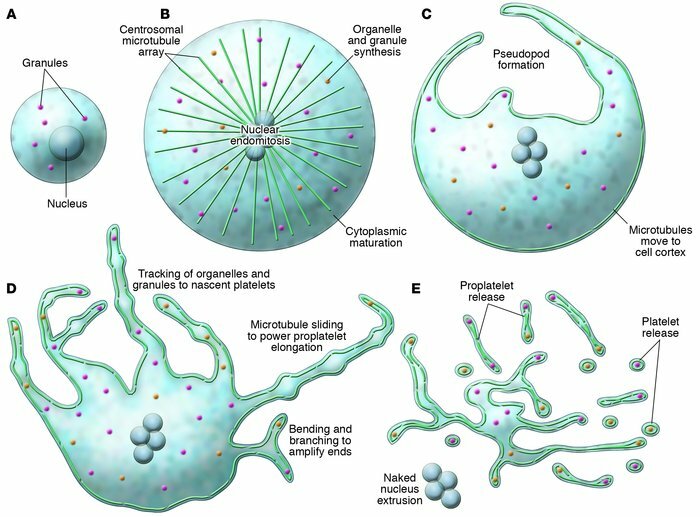 At the point in development when secondary granules can be recognized, the cell becomes a myelocyte. 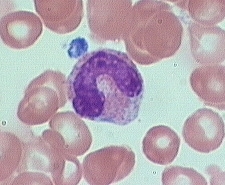 Myelocytes (10-18m) are not normally found in the peripheral blood. Nucleoli may not be seen in the late myelocyte. Primary azurophilic granules are still present, but secondary granules predominate. Secondary granules (neut, eos, or baso) first appear adjacent to the nucleus. In neutrophils this is the “dawn” of neutrophilia. Metamyelocytes (10-18m) have kidney shaped indented nuclei and dense chromatin along the nuclear membrane. The cytoplasm is faintly pink, and they have secondary granules (neutro, eos, or baso). Zero to one percent of the peripheral blood white cells may be metamyelocytes (juveniles). Bands, slightly smaller than juveniles, are marked by a U-shaped or deeply indented nucleus. Segmented (segs) or polymorphonuclear (PMN) leukocytes (average 14 m dia) are distinguished by definite lobation with thin thread-like filaments of chromatin joining the 2-5 lobes. 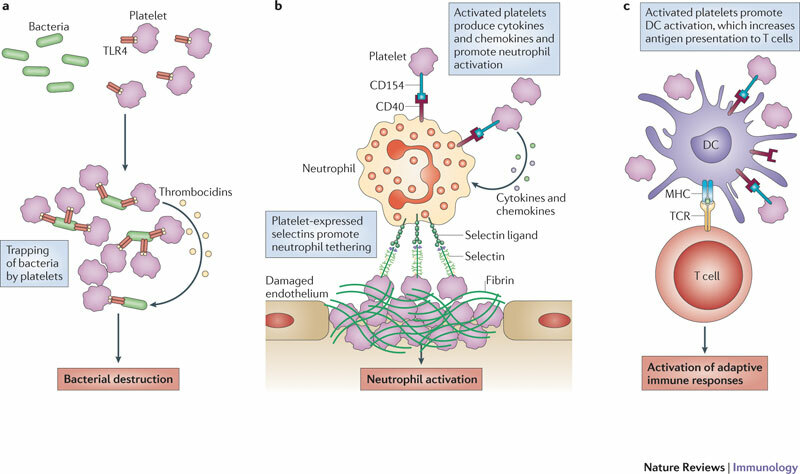 45-75% of the peripheral blood white cells are segmented neutrophils. Large progenitor cells in the bone marrow called megakaryocytes (MKs) are the source of platelets. MKs release platelets through a series of fascinating cell biological events. During maturation, they become polyploid and accumulate massive amounts of protein and membrane. Then, in a cytoskeletal-driven process, they extend long branching processes, designated proplatelets, into sinusoidal blood vessels where they undergo fission to release platelets. Practical Diagnosis of Hematologic Disoreders. 4th edition. Vol 2. Kjeldsberg CR, Ed. ASCP Press. 2006. Chicago, IL. This site is up-to-date and revised periodically. It is the best site for pathology information. People tend to make decisions and consider information in a step-by-step manner in which intermediate decisions are intermixed with data acquisition steps. The sequence in which components of decisions are made may alter the decision outcome. People tend to consider information in the sequence it is requested or displayed. Since there is a separate optimum sequence of tests and questions for each cluster of history and presenting symptoms, there is no one sequence of tests and questions that can be optimal for all presenting clusters. As additional data and test results are acquired, the optimal sequence of further testing and data acquisition changes, depending on the already acquired information. Therefore, promoting an arbitrary sequence of information requests with preprinted forms may detract from outcomes by contributing to a non-optimal decision-making sequence. Unlike the decisions resulting from theoretical or normative processes, decisions made by humans are path dependent; that is, the out-come of a decision process may be different if the same components are considered in a different sequence. This paper proposes a general approach to gathering data at their source in computer-based form so as to improve the expected outcomes. Such a means must be interactive and dynamic, so that at any point in the clinical process the patient’s presenting symptoms, history, and the data already collected are used to determine the next data or tests requested. That de-termination must derive from a decision-making strategy designed to produce outcomes with the greatest value and supported by appropriate data collection and display techniques. The strategy must be based on the knowledge of the possible outcomes at any given stage of testing and information gathering, coupled with a metric, or hierarchy of values for assessing the relative desirability of the possible outcomes. The numbered list below illustrates a value hierarchy. In any particular instance, the higher-numbered values should only be considered once the lower- numbered values have been satisfied. Thus, a diagnostic sequence that is very time or cost efficient should only be considered if it does not increase the likelihood (relative to some other diagnostic sequence) that a life-threatening disorder may be missed, or that one of the diagnostic procedures may cause discomfort. Minimize the likelihood that a treatable, life-threatening disorder is not treated. Minimize the likelihood that a treatable, discomfort-causing disorder is not treated. Minimize the likelihood that a risky procedure(treatment or diagnostic procedure) is inappropriately administered. Minimize the likelihood that a discomfort-causing procedure is inappropriately administered. Minimize the likelihood that a costly procedure is inappropriately administered. Minimize the time of diagnosing and treating thepatient.8.Minimize the cost of diagnosing and treating the patient. The above hierarchy is relative, not absolute; for many patients, a little bit of testing discomfort may be worth a lot of time. There are also some factors and graduations intentionally left out for expository simplicity (e.g., acute versus chronic disorders).This value hierarchy is based on a hypothetical patient. Clearly, the hierarchy of a health insurance carrier might be different, as might that of another patient (e.g., a geriatric patient). If the approach outlined herein were to be followed, a value hierarchy agreed to by a majority of stakeholders should be adopted. Once the higher values are satisfied, the time and cost of diagnosis and treatment should be minimized. One way to do so would be to optimize the sequence in which tests are performed, so as to minimize the number, cost, and time of tests that need to be per-formed to reach a definitive decision regarding treatment. Such an optimum sequence could be constructed using Claude Shannon’s information theory. According to this theory, the best next question to ask under any given situation (assuming the question has two possible outcomes) is that question that divides the possible outcomes into two equally likely sets. In the real world, all tests or questions are not equally valuable, costly, or time consuming; therefore, value(risk factors), cost, and time should be used as weighting factors to optimize the test sequence, but this is a complicating detail at this point. For dynamic computation of outcome values, the hierarchy could be converted into a weighted value scale so differing outcomes at more than one level of the hierarchy could be readily compared. An example of such a weighted value scale is Quality Adjusted Life Years (QALY). Although QALY does not incorporate all of the factors in this example, it is a good conceptual starting place. sources, then attempting to track them against each other over time. Manually reorganizing this clinical information each time it is used is extremely inefficient. More important, the current organization and formatting defies principles of human factors for optimally displaying information to enhance human information-processing characteristics, particularly for decision support. Minimize the load on short-term memory. Provide information pertinent to a given decision or component of a decision in a compact, contiguous space. Take advantage of basic human perceptual and pat-tern recognition facilities. Design the form of an information display to com-plement the decision-making task it supports. F i g u re 1 shows fictitious, quasi-random data from a hypothetical patient with moderately elevated cholesterol. This one-page display pulls together all the pertinent data from six years of blood tests and related clinical measurements. At a glance, the physician’s innate pattern recognition, color, and shape perception facilities recognize the patient’s steadily increasing weight, cholesterol, BP, and triglycerides as well as the declining high-density lipoproteins. It would have taken considerably more time and effort to grasp this information from the raw data collection and blood test reports as they are currently presented in independent, tabular time slices. Design the formulation of an information display to complement the decision-making task. The physician may wish to know only the relationship between weight and cardiac risk factors rather than whether these measures are increasing or decreasing, or are within acceptable or marginal ranges. If so, Table 1 shows the correlations between weight and the other factors in a much more direct and simple way using the same data as in Figure 1. One can readily see the same conclusions about relations that were drawn from Figure 1.This type of abstract, symbolic display of derived information also makes it easier to spot relationships when the individual variables are bouncing up and down, unlike the more or less steady rise of most values in Figure 1. This increase in precision of relationship information is gained at the expense of other types of information (e.g., trends). To display information in an optimum form then, the system designer must know what the information demands of the task are at the point in the task when the display is to be used. Present the sequence of information display clusters to complement an optimum decision-making strategy. Just as a fixed sequence of gathering clinical, diagnostic information may lead to a far from optimum outcome, there exists an optimum sequence of testing, considering information, and gathering data that will lead to an optimum outcome (as defined by the value hierarchy) with a minimum of time and expense. The task of the information system designer, then, is to provide or request the right information, in the best form, at each stage of the procedure. For ex-ample, Figure 1 is suitable for the diagnostic phase since it shows the current state of the risk factors and their trends. Table 1, on the other hand, might be more appropriate in determining treatment, where there may be a choice of first trying a strict dietary treatment, or going straight to a combination of diet plus medication. The fact that Figure 1 and Table 1 have somewhat redundant information is not a problem, since they are intended to optimally provide information for different decision-making tasks. The critical need, at this point, is for a model of how to determine what information should be requested, what tests to order, what information to request and display, and in what form at each step of the decision-making process. Commitment to a collaborative relationship between physicians and laboratorians and other information providers would be an essential requirement for such an undertaking. The ideal diagnostic data-collection instrument is a flexible, computer-based device, such as a notebook computer or Personal Digital Assistant (PDA) sized device. Make the data collection a natural part of the clinical process. Ensure that the user interface is extremely friendly, easy to learn, and easy to use. Use a small, portable device. Use the same device for collection and display of existing information (e.g., test results and his-tory). Minimize the need for free-form written data entry (use check boxes, forms, etc.). Allow the entry of notes in pen-based free-form (with the option of automated conversion of numeric data to machine-manipulable form). Give the physicians a more direct benefit for collecting data, not just a means of helping a clerk at an HMO second-guess the physician’s judgment. Improve administrative efficiency in the office. Make the data collection complement the clinical decision-making process. Improve information displays, leading to better outcomes. Make better use of the physician’s time and mental effort. The medical profession is facing a crisis of information. Gathering information is costing a typical practice more and more while fees are being restricted by third parties, and the process of gathering this in-formation may be detrimental to current outcomes. Gathered properly, in machine-manipulable form, these data could be reformatted so as to greatly improve their value immediately in the clinical setting by leading to decisions with better outcomes and, in the long run, by contributing to a clinical data warehouse that could greatly improve medical knowledge. The challenge is to create a mechanism for data collection that facilitates, hastens, and improves the outcomes of clinical activity while minimizing the inconvenience and resistance to change on the part of clinical practitioners. This paper is intended to provide a high-level overview of how this may be accomplished, and start a dialogue along these lines. Tversky A. Elimination by aspects: a theory of choice. Psych Rev 1972; 79:281–99. Didner RS. Back-to-front design: a guns and butter approach. Ergonomics 1982; 25(6):2564–5. Shannon CE. A mathematical theory of communication. Bell System Technical J 1948; 27:379–423 (July), 623–56 (Oct). Feeny DH, Torrance GW. Incorporating utility-based quality-of-life assessment measures in clinical trials: two examples. Med Care 1989; 27:S190–204. Smith S, Mosier J. Guidelines for designing user interface soft-ware. ESD-TR-86-278, Aug 1986. Miller GA. The magical number seven plus or minus two. Psych Rev 1956; 65(2):81–97. Sternberg S. High-speed scanning in human memory. Science 1966; 153: 652–4. Figure 1 Hypothetical patient data. Lawrie CH, Ch 22. Pp541-552. A model for automated screening of thalassemia in hematology (math study). Kneifati-Hayek J, Fleischman W, Bernstein LH, Riccioli A, Bellevue R.
Lab Hematol. 2007; 13(4):119-23. http://dx.doi.org:/10.1532/LH96.07003. The results of 398 patient screens were collected. Data from the set were divided into training and validation subsets. The Mentzer ratio was determined through a receiver operating characteristic (ROC) curve on the first subset, and screened for thalassemia using the second subset. HgbA2 levels were used to confirm beta-thalassemia. RESULTS: We determined the correct decision point of the Mentzer index to be a ratio of 20. Physicians can screen patients using this index before further evaluation for beta-thalassemia (P < .05). CONCLUSION: The proposed method can be implemented by hospitals and laboratories to flag positive matches for further definitive evaluation, and will enable beta-thalassemia screening of a much larger population at little to no additional cost. Bernstein LH, Rucinski J. Clin Chem Lab Med. 2011 Sep 21;49(12):2089-95. David G, Bernstein LH, Coifman RR. Nutrition. 2013 Jan; 29(1):113-21. Acute lymphoblastic leukemia (ALL) is the most common hematologic malignancy that occurs in children. Although more than 90% of children with ALL now survive to adulthood, those with the rarest and high-risk forms of the disease continue to have poor prognoses. Through the Pediatric Cancer Genome Project (PCGP), investigators in the Hematological Malignancies Program are identifying the genetic aberrations that cause these aggressive forms of leukemias. Here we present two studies on the genetic bases of early T-cell precursor ALL and acute megakaryoblastic leukemia. Early T-cell precursor ALL (ETP-ALL), which comprises 15% of all pediatric T-cell leukemias, is an aggressive disease that is typically resistant to contemporary therapies. Children with ETP-ALL have a high rate of relapse and an extremely poor prognosis (i.e., 5-year survival is approximately 20%). The genetic basis of ETP-ALL has remained elusive. Although ETP-ALL is associated with a high burden of DNA copy number aberrations, none are consistently found or suggest a unifying genetic alteration that drives this disease. Through the efforts of the PCGP, Jinghui Zhang, PhD (Computational Biology), James R. Downing, MD (Pathology), Charles G. Mullighan, MBBS(Hons), MSc, MD (Pathology), and colleagues analyzed the whole-genome sequences of leukemic cells and matched normal DNA from 12 pediatric patients with ETP-ALL. The identified genetic mutations were confirmed in a validation cohort of 52 ETP-ALL specimens and 42 non-ETP T-lineage ALLs (T-ALL). In the journal Nature, the investigators reported that each ETP-ALL sample carried an average of 1140 sequence mutations and 12 structural variations. Of the structural variations, 51% were breakpoints in genes with well-established roles in hematopoiesis or leukemogenesis (e.g., MLH2,SUZ12, and RUNX1). Eighty-four percent of the structural variations either caused loss of function of the gene in question or resulted in the formation of a fusion gene such as ETV6-INO80D. The ETV6 gene, which encodes a protein that is essential for hematopoiesis, is frequently mutated in leukemia. Among the DNA samples sequenced in this study, ETV6 was altered in 33% of ETP-ALL but only 10% of T-ALL cases. Ther Adv Hematol. 2012 Dec; 3(6): 333–339. The application of high-throughput, massively parallel sequencing technologies to hematologic malignancies over the past several years has provided novel insights into disease initiation, progression, and response to therapy. Here, we describe how these new DNA sequencing technologies have been applied to hematolymphoid malignancies. With further improvements in the sequencing and analysis methods as well as integration of the resulting data with clinical information, we expect these technologies will facilitate more precise and tailored treatment for patients with hematologic neoplasms. J Clin Oncol. 2013 May 20; 31(15):1885-92. The use of candidate gene and genome-wide discovery studies in the last several years has led to an expansion of our knowledge of the spectrum of recurrent, somatic disease alleles, which contribute to the pathogenesis of hematologic malignancies. Notably, these studies have also begun to fundamentally change our ability to develop informative prognostic schema that inform outcome and therapeutic response, yielding substantive insights into mechanisms of hematopoietic transformation in different tissue compartments. Although these studies have already had important biologic and translational impact, significant challenges remain in systematically applying these findings to clinical decision making and in implementing new technologies for genetic analysis into clinical practice to inform real-time decision making. Here, we review recent major genetic advances in myeloid and lymphoid malignancies, the impact of these findings on prognostic models, our understanding of disease initiation and evolution, and the implication of genomic discoveries on clinical decision making. Finally, we discuss general concepts in genetic modeling and the current state-of-the-art technology used in genetic investigation. E Wattel, C Preudhomme, B Hecquet, M Vanrumbeke, et AL. We analyzed the prognostic value of p53 mutations for response to chemotherapy and survival in acute myeloid leukemia (AML), myelodysplastic syndrome (MDS), and chronic lymphocytic leukemia (CLL). Mutations were detected by single-stranded conformation polymorphism (SSCP) analysis of exons 4 to 10 of the P53 gene, and confirmed by direct sequencing. A p53 mutation was found in 16 of 107 (15%) AML, 20 of 182 (11%) MDS, and 9 of 81 (11%) CLL tested. In AML, three of nine (33%) mutated cases and 66 of 81 (81%) nonmutated cases treated with intensive chemotherapy achieved complete remission (CR) (P = .005) and none of five mutated cases and three of six nonmutated cases treated by low-dose Ara C achieved CR or partial remission (PR) (P = .06). Median actuarial survival was 2.5 months in mutated cases, and 15 months in nonmutated cases (P < lo-‘). In the MDS patients who received chemotherapy (intensive chemotherapy or low-dose Ara C), 1 of 13 (8%) mutated cases and 23 of 38 (60%) nonmutated cases achieved CR or PR (P = .004), and median actuarial survival was 2.5 and 13.5 months, respectively (P C lo-’). In all MDS cases (treated and untreated), the survival difference between mutated cases and nonmutated cases was also highly significant. In CLL, 1 of 8 (12.5%) mutated cases treated by chemotherapy (chlorambucil andlor CHOP andlor fludarabine) responded, as compared with 29 of 36 (80%) nonmutated cases (P = .02). In all CLL cases, survival from p53 analysis was significantly shorter in mutated cases (median 7 months) than in nonmutated cases (median not reached) (P < IO-’). In 35 of the 45 mutated cases of AML, MDS, and CLL, cytogenetic analysis or SSCP and sequence findings showed loss of the nonmutated P53 allele. Our findings show that p53 mutations are a strong prognostic indicator of response to chemotherapy and survival in AML, MDS, and CLL. The usual association of p53 mutations to loss of the nonmutated P53 allele, in those disorders, ie, to absence of normal p53 in tumor cells, suggests that p53 mutations could induce drug resistance, at least in part, by interfering with normal apoptotic pathways in tumor cells. In the past several years, experiments using DNA microarrays have contributed to an increasingly refined molecular taxonomy of hematologic malignancies. In addition to the characterization of molecular profiles for known diagnostic classifications, studies have defined patterns of gene expression corresponding to specific molecular abnormalities, oncologic phenotypes, and clinical outcomes. Furthermore, novel subclasses with distinct molecular profiles and clinical behaviors have been identified. In some cases, specific cellular pathways have been highlighted that can be therapeutically targeted. The findings of microarray studies are beginning to enter clinical practice as novel diagnostic tests, and clinical trials are ongoing in which therapeutic agents are being used to target pathways that were identified by gene expression profiling. While the technology of DNA microarrays is becoming well established, genome-wide surveys of gene expression generate large data sets that can easily lead to spurious conclusions. Many challenges remain in the statistical interpretation of gene expression data and the biologic validation of findings. As data accumulate and analyses become more sophisticated, genomic technologies offer the potential to generate increasingly sophisticated insights into the complex molecular circuitry of hematologic malignancies. This review summarizes the current state of discovery and addresses key areas for future research. No other laboratory method provides as rapid and detailed analysis of cellular populations as flow cytometry, making it a valuable tool for diagnosis and management of several hematologic and immunologic diseases. Understanding this relevant methodology is important for any medical laboratory scientist. Whether you have no previous experience with flow cytometry or just need a refresher, this course will help you to understand the basic principles, with the help of video tutorials and interactive case studies. 6.2.5.1.2.1 New treatment approaches in acute myeloid leukemia: review of recent clinical studies. 6.2.5.1.2.2 Novel approaches to the treatment of acute myeloid leukemia. 6.5.1.2.3 Current treatment of acute myeloid leukemia. High-dose chemotherapy with stem cell transplant is a method of giving high doses of chemotherapy and replacing blood-forming cells destroyed by the cancer treatment. Stem cells (immature blood cells) are removed from the blood or bone marrow of the patient or a donor and are frozen and stored. After the chemotherapy is completed, the stored stem cells are thawed and given back to the patient through an infusion. These reinfused stem cells grow into (and restore) the body’s blood cells. Donor lymphocyte infusion (DLI) is a cancer treatment that may be used after stem cell transplant.Lymphocytes (a type of white blood cell) from the stem cell transplant donor are removed from the donor’s blood and may be frozen for storage. The donor’s lymphocytes are thawed if they were frozen and then given to the patient through one or more infusions. The lymphocytes see the patient’s cancer cells as not belonging to the body and attack them. 6.2.5.1.3.2 What`s new in chronic myeloid leukemia research and treatment? Imatinib and other drugs that target the BCR-ABL protein have proven to be very effective, but by themselves these drugs don’t help everyone. Studies are now in progress to see if combining these drugs with other treatments, such as chemotherapy, interferon, or cancer vaccines (see below) might be better than either one alone. One study showed that giving interferon with imatinib worked better than giving imatinib alone. The 2 drugs together had more side effects, though. It is also not clear if this combination is better than treatment with other tyrosine kinase inhibitors (TKIs), such as dasatinib and nilotinib. A study going on now is looking at combing interferon with nilotinib. Other studies are looking at combining other drugs, such as cyclosporine or hydroxychloroquine, with a TKI. Because researchers now know the main cause of CML (the BCR-ABL gene and its protein), they have been able to develop many new drugs that might work against it. In some cases, CML cells develop a change in the BCR-ABL oncogene known as a T315I mutation, which makes them resistant to many of the current targeted therapies (imatinib, dasatinib, and nilotinib). Ponatinib is the only TKI that can work against T315I mutant cells. More drugs aimed at this mutation are now being tested. Other drugs called farnesyl transferase inhibitors, such as lonafarnib and tipifarnib, seem to have some activity against CML and patients may respond when these drugs are combined with imatinib. These drugs are being studied further. Other drugs being studied in CML include the histone deacetylase inhibitor panobinostat and the proteasome inhibitor bortezomib (Velcade). Several vaccines are now being studied for use against CML. Chronic lymphocytic leukemia is a type of cancer in which the bone marrow makes too many lymphocytes (a type of white blood cell). Older age can affect the risk of developing chronic lymphocytic leukemia. Signs and symptoms of chronic lymphocytic leukemia include swollen lymph nodes and tiredness. Chronic lymphocytic leukemia (also called CLL) is a blood and bone marrow disease that usually gets worse slowly. CLL is one of the most common types of leukemia in adults. It often occurs during or after middle age; it rarely occurs in children. Anatomy of the bone; drawing shows spongy bone, red marrow, and yellow marrow. 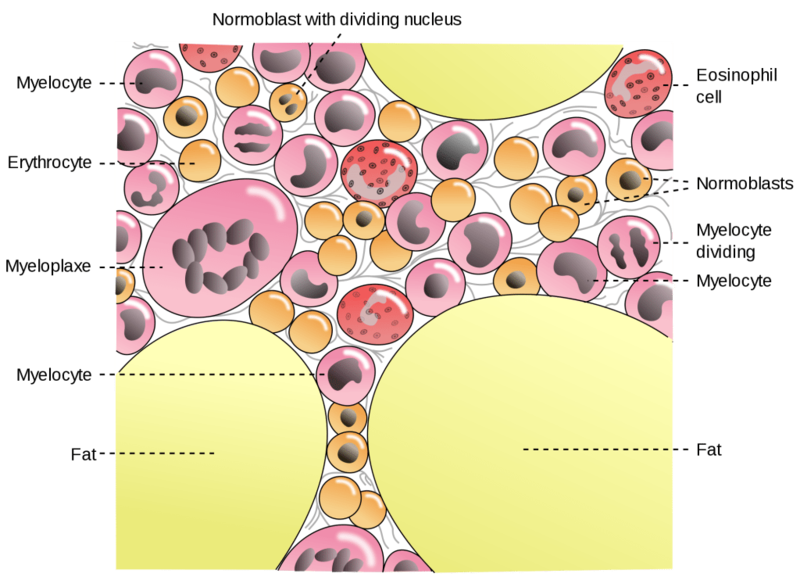 A cross section of the bone shows compact bone and blood vessels in the bone marrow. Also shown are red blood cells, white blood cells, platelets, and a blood stem cell. Normally, the body makes blood stem cells (immature cells) that become mature blood cells over time. A blood stem cell may become a myeloid stem cell or a lymphoid stem cell. T lymphocytes that help B lymphocytes make antibodies to fight infection. Blood cell development; drawing shows the steps a blood stem cell goes through to become a red blood cell, platelet, or white blood cell. 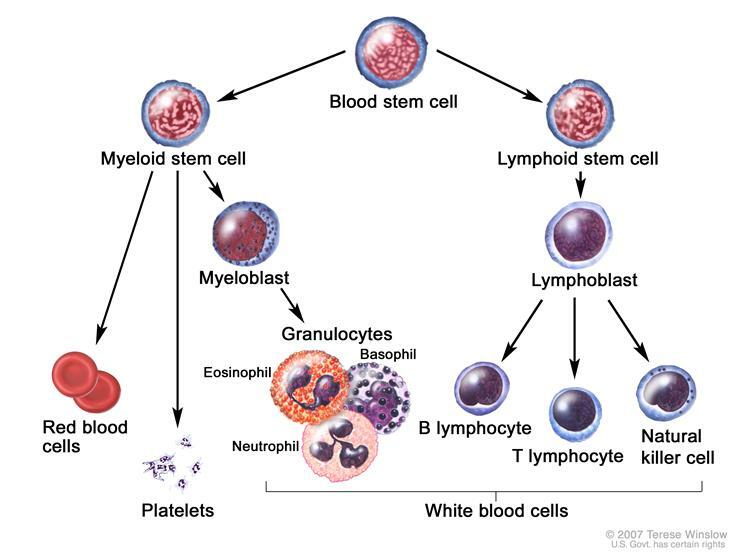 A myeloid stem cell becomes a red blood cell, a platelet, or a myeloblast, which then becomes a granulocyte (the types of granulocytes are eosinophils, basophils, and neutrophils). A lymphoid stem cell becomes a lymphoblast and then becomes a B-lymphocyte, T-lymphocyte, or natural killer cell. In CLL, too many blood stem cells become abnormal lymphocytes and do not become healthy white blood cells. The abnormal lymphocytes may also be called leukemia cells. The lymphocytes are not able to fight infection very well. Also, as the number of lymphocytes increases in the blood and bone marrow, there is less room for healthy white blood cells, red blood cells, and platelets. This may cause infection, anemia, and easy bleeding. Adult Acute Lymphoblastic Leukemia Treatment. Being middle-aged or older, male, or white. A family history of CLL or cancer of the lymph system. Having relatives who are Russian Jews or Eastern European Jews. Painless swelling of the lymph nodes in the neck, underarm, stomach, or groin. Pain or fullness below the ribs. Treatment options for chronic lymphocytic leukemia (CLL) vary greatly, depending on the person’s age, the disease risk group, and the reason for treating (for example, which symptoms it is causing). Many people live a long time with CLL, but in general it is very difficult to cure, and early treatment hasn’t been shown to help people live longer. Because of this and because treatment can cause side effects, doctors often advise waiting until the disease is progressing or bothersome symptoms appear, before starting treatment. If treatment is needed, factors that should be taken into account include the patient’s age, general health, and prognostic factors such as the presence of chromosome 17 or chromosome 11 deletions or high levels of ZAP-70 and CD38. Patients who might not be able to tolerate the side effects of strong chemotherapy (chemo), are often treated with chlorambucil alone or with a monoclonal antibody targeting CD20 like rituximab (Rituxan) or obinutuzumab (Gazyva). Other options include rituximab alone or a corticosteroid like prednisione. Other drugs or combinations of drugs may also be also used. If the only problem is an enlarged spleen or swollen lymph nodes in one region of the body, localized treatment with low-dose radiation therapy may be used. Splenectomy (surgery to remove the spleen) is another option if the enlarged spleen is causing symptoms. Sometimes very high numbers of leukemia cells in the blood cause problems with normal circulation. This is calledleukostasis. Chemo may not lower the number of cells until a few days after the first dose, so before the chemo is given, some of the cells may be removed from the blood with a procedure called leukapheresis. This treatment lowers blood counts right away. The effect lasts only for a short time, but it may help until the chemo has a chance to work. Leukapheresis is also sometimes used before chemo if there are very high numbers of leukemia cells (even when they aren’t causing problems) to prevent tumor lysis syndrome (this was discussed in the chemotherapy section). Some people who have very high-risk disease (based on prognostic factors) may be referred for possible stem cell transplant (SCT) early in treatment. If the initial treatment is no longer working or the disease comes back, another type of treatment may help. If the initial response to the treatment lasted a long time (usually at least a few years), the same treatment can often be used again. If the initial response wasn’t long-lasting, using the same treatment again isn’t as likely to be helpful. The options will depend on what the first-line treatment was and how well it worked, as well as the person’s health. Many of the drugs and combinations listed above may be options as second-line treatments. For many people who have already had fludarabine, alemtuzumab seems to be helpful as second-line treatment, but it carries an increased risk of infections. Other purine analog drugs, such as pentostatin or cladribine (2-CdA), may also be tried. Newer drugs such as ofatumumab, ibrutinib (Imbruvica), and idelalisib (Zydelig) may be other options. If the leukemia responds, stem cell transplant may be an option for some patients. Some people may have a good response to first-line treatment (such as fludarabine) but may still have some evidence of a small number of leukemia cells in the blood, bone marrow, or lymph nodes. This is known as minimal residual disease. CLL can’t be cured, so doctors aren’t sure if further treatment right away will be helpful. Some small studies have shown that alemtuzumab can sometimes help get rid of these remaining cells, but it’s not yet clear if this improves survival. One of the most serious complications of CLL is a change (transformation) of the leukemia to a high-grade or aggressive type of non-Hodgkin lymphoma called diffuse large cell lymphoma. This happens in about 5% of CLL cases, and is known as Richter syndrome. Treatment is often the same as it would be for lymphoma (see our document called Non-Hodgkin Lymphoma for more information), and may include stem cell transplant, as these cases are often hard to treat. Less often, CLL may transform to prolymphocytic leukemia. As with Richter syndrome, these cases can be hard to treat. Some studies have suggested that certain drugs such as cladribine (2-CdA) and alemtuzumab may be helpful. In rare cases, patients with CLL may have their leukemia transform into acute lymphocytic leukemia (ALL). If this happens, treatment is likely to be similar to that used for patients with ALL (see our document called Leukemia: Acute Lymphocytic). Acute myeloid leukemia (AML) is another rare complication in patients who have been treated for CLL. Drugs such as chlorambucil and cyclophosphamide can damage the DNA of blood-forming cells. These damaged cells may go on to become cancerous, leading to AML, which is very aggressive and often hard to treat (see our document calledLeukemia: Acute Myeloid). The most widely used therapies are combinations of chemotherapyand radiation therapy. Biological therapy, which targets key features of the lymphoma cells, is used in many cases nowadays. The goal of medical therapy in lymphoma is complete remission. This means that all signs of the disease have disappeared after treatment. Remission is not the same as cure. In remission, one may still have lymphoma cells in the body, but they are undetectable and cause no symptoms. When in remission, the lymphoma may come back. This is called recurrence. The duration of remission depends on the type, stage, and grade of the lymphoma. A remission may last a few months, a few years, or may continue throughout one’s life. Remission that lasts a long time is called durable remission, and this is the goal of therapy. The duration of remission is a good indicator of the aggressiveness of the lymphoma and of the prognosis. A longer remission generally indicates a better prognosis. Remission can also be partial. This means that the tumor shrinks after treatment to less than half its size before treatment. Improvement: The lymphoma shrinks but is still greater than half its original size. Stable disease: The lymphoma stays the same. Progression: The lymphoma worsens during treatment. Refractory disease: The lymphoma is resistant to treatment. Induction therapy is designed to induce a remission. If this treatment does not induce a complete remission, new or different therapy will be initiated. This is usually referred to as salvage therapy. Once in remission, one may be given yet another treatment to prevent recurrence. This is called maintenance therapy. Many different types of chemotherapy may be used for Hodgkin lymphoma. The most commonly used combination of drugs in the United States is called ABVD. Another combination of drugs, known as BEACOPP, is now widely used in Europe and is being used more often in the United States. There are other combinations that are less commonly used and not listed here. The drugs that make up these two more common combinations of chemotherapy are listed below. ABVD: Doxorubicin (Adriamycin), bleomycin (Blenoxane), vinblastine (Velban, Velsar), and dacarbazine (DTIC-Dome). ABVD chemotherapy is usually given every two weeks for two to eight months. BEACOPP: Bleomycin, etoposide (Toposar, VePesid), doxorubicin, cyclophosphamide (Cytoxan, Neosar), vincristine (Vincasar PFS, Oncovin), procarbazine (Matulane), and prednisone (multiple brand names). There are several different treatment schedules, but different drugs are usually given every two weeks. The type of chemotherapy, number of cycles of chemotherapy, and the additional use of radiation therapy are based on the stage of the Hodgkin lymphoma and the type and number of prognostic factors. Waldenström macroglobulinemia is a type of non-Hodgkin lymphoma. Signs and symptoms of adult non-Hodgkin lymphoma include fever, sweating, weight loss, and fatigue. Tests that examine the body and lymph system are used to help detect (find) and diagnose adult non-Hodgkin lymphoma. Because lymph tissue is found throughout the body, adult non-Hodgkin lymphoma can begin in almost any part of the body. Cancer can spread to the liver and many other organs and tissues. Cytogenetic analysis : A laboratory test in which cells in a sample of tissue are viewed under a microscope to look for certain changes in the chromosomes. Immunophenotyping : A process used to identify cells, based on the types of antigens ormarkers on the surface of the cell. This process is used to diagnose specific types of leukemia and lymphoma by comparing the cancer cells to normal cells of the immune system. The amount of beta-2-microglobulin in the blood (for Waldenström macroglobulinemia). Stages of adult non-Hodgkin lymphoma may include E and S.
E: “E” stands for extranodal and means the cancer is found in an area or organ other than the lymph nodes or has spread to tissues beyond, but near, the major lymphatic areas. S: “S” stands for spleen and means the cancer is found in the spleen. Stage I adult non-Hodgkin lymphoma is divided into stage I and stage IE. Stage II adult non-Hodgkin lymphoma is divided into stage II and stage IIE. Stage III adult non-Hodgkin lymphoma is divided into stage III, stage IIIE, stage IIIS, and stage IIIE+S. Adult non-Hodgkin lymphomas are also described based on how fast they grow and where the affected lymph nodes are in the body. Indolent & aggressive. Reblogged this on Docencia C.Salud Buenos Aires Madrid. A large portion of this page, following “Nat Pernick, Ed. Primary references acute leukemia-general AML general AML classification transient abnormal myelopoiesis”, is a cut and paste from an old version of our website, which violates our copyright. Please remove it immediately, or we will take legal action, which may shut down your website. Instead, we suggest you link to the appropriate page, http://www.pathologyoutlines.com/leukemia.html, which not only is legal, but gives your readers access to the most current version of our content. Contact me at NatPernick@gmail.com with any questions.